The perfect addition to any environment, this space-efficient wastebasket is perfect for any office, home, or home-office. 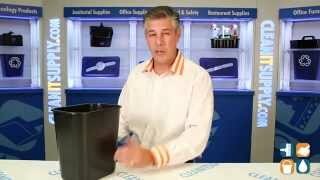 Making trash disposal easy and convenient, Rubbermaid's wastebasket comes in a 13 5/8 quart capacity. 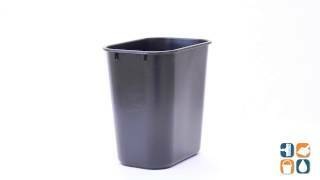 Coming in a sleek black color, this economical yet stylish small waste basket fits almost any indoor environment seamlessly, making it a perfect fit anywhere it is needed. Meeting or exceeding all EPA guidelines, the Rubbermaid Plastic Wastebasket measures 11-3/8"L x 8-1/4"W x 12-1/8"H.